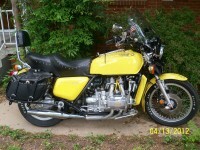 I need new tires for a 82 goldwing gl1100. The rear that is on it now is 130/90/16 but there is no size on the front. any ideas what size i should get. The 1982 uses a 120/90/18. Really? No size markings on the old tire? Very strange. I've never seen a tire w/o the size markings on it.